We assist organizations create and implement a Health and Safety manual with policies and procedures to ensure your due diligence and compliance. We can work closely with your company's Joint Health and Safety Committee (JHSC) to ensure implementation is smooth and quick to enable the JHSC to effectively monitor maintain these programs. 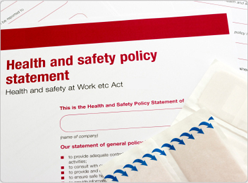 Contact us now to learn more about preparing a tailored health and safety manual for your company to ensure a healthy, productive and compliant working environment for your staff.